Global Awakening, New Science and the 21st Century Enlightenment explains how we can solve all of the problems that now threatens the very existence of life on Earth. 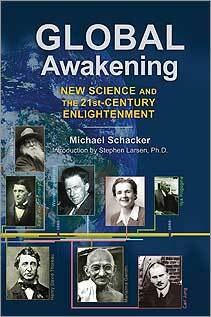 What is the “new thinking” that is bringing about a new enlightened global consciousness? How can we see our way through this mess we’ve made? How can we move toward personal and planetary transformation? We are in a time of great transition. The story we get from most of the news media doesn’t tell us what is really happening. The story given to us by our parents, our education, our institutions, and our society is missing the essential pieces that we need in order to grasp the changes that are taking place right now. In fact, almost none of what you are about to learn has been reported or taught in our schools and colleges. Finding out the whole story of how things change–when it changed and who made these changes happen leads to a “New Story”. It gives surprising new answers to the basic questions: Who are we? How did we get here? and Where are we going? Will humanity self-destruct or can we change our future? What is the core problem? Once we know what the core problem is—how can we change? What are the real solutions to our global crisis? Paradigm shifts, or major leaps in human thought and potential are not new–shifts have happened in the past. To fully understand where we are now and what we can do, we must find out how deep change was brought about in the past. The mechanistic paradigm is the cause of all the current crises of the world–including poverty, famine, environmental disasters, pollution, war, violence and climate change. But it is now breaking down and a new paradigm, the organic model of thinking is bringing about the Organic Shift–a more sophisticated worldview that is based on natural processes of regeneration. The hidden knowledge from the creative geniuses who have been working toward this new thinking for over 250 years can show us how this movement is already creating, for the first time, the possibility of a truly positive future. Global regeneration is the new scientific method that will not only solve our current problems, but will allow us to go beyond isolated fixes and merely “sustainable” solutions. Regenerative science and the new thinking mirrors Nature, reflecting the organic forms and regenerative processes of the natural universe. The new thinking and acting that comes out of this sparks new insights and drives new innovations that don’t have the unintended consequences and destructive qualities of our current mechanistic worldview. The new thinking and regenerative solutions are already underway here and now. Find out the answers to these questions and how you can become an enlightened activist for change. I found A Spring Without Bees shortly after becoming a backyard beekeeper a few years ago. I recommend it to everyone. I was looking it up to provide a link last night and I was shocked to discover what had happened in the interim to you, Michael Schacker. So relieved to find this updated website 2 hours later. Please update your bee websites with this page link! I want to read your new books. We still need to educate American beekeepers, the media disinformation campaign from the pesticide industry is confusing even them. I received my new book ‘Global Awakening’ a few days ago and have been reading it every chance I get. It has been a real eye opener and life changer. I am going to recommend this book to all of my family and friends. Thank you so much for all of your hard work and dedication. Absolutely brilliant!